The motorcycle pricing has indeed become more reasonable. For the above example we only pay $4000 more at today's exchange rate for the same machine inclusive of shipping/import tax etc. Nevertheless the clothing etc. remains as it was. For example FXRG Triple Vent Riding Jacket, your price $650 ours £663.49 or $862 in your money. Maybe IF Brexit happens things may get better perhaps, but what on Earth would you want to buy from us? Beer! We get the same screwing in Canada!!! but what on Earth would you want to buy from us? Beer! Started to say Caitriona Balfe. But she's Irish. Did not know she was for sale. I bought my 18 CVO Road Glide here in the U.K. for less than MRSP and I love it. My first CVO was a 14 Road King and I loved that. It always made me feel very special and the paintwork looked awesome. When I was deciding to switch to a RG I couldn’t decide whether to go for the RG Special and then spend money customising it. The fact that the CVO has the 21” wheel and the 117 swayed it as I would have had to spend some serious money to have got anywhere near the CVO including a custom paint job. Having said that the Special now comes with the 114 and the GTS so I often wonder what I had done if the decision was now. I don’t regret it though as I never regret anything as you just don’t know what’s round the corner. Let’s face it none of us are getting out of here alive!! I'm on the verge of pulling the trigger on a '19 Mako Blue Road Glide CVO. I'm being offered a much better deal than other dealers offered me on a Scorched Orange Limited, pretty close to the same money. Also, I've looked at two used CVOs and they were actually worse deals. I love the color and I've wanted one since I came around to the Harley touring bikes three years ago. My question, has anyone been totally dissatisfied with their purchase of a CVO? Did anyone regret it? Well here goes i just purchased a Mako Blue 2 months ago and love it! I also own a 2011 CVO Road Glide Ultra Classic (WILL NEVER BE FOR SALE) and have owned over 11 CVO bikes in total over the past several years and i see most dealers only keep these things here in AZ for a couple days and in most cases have deposits before they arrive! Demand is still high and resale value is great in my opinion and i wouldn't hesitate to buy that thing! Matter of fact get your deposit on it done before its sold! 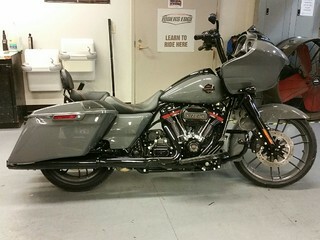 I just bought a 2019 CVO Road Glide, the two-tone silver one. I came from a 2015 Road Glide Special that I added boom 2 stereo, lowers with speakers and a chopped tour pack. Also had George Bryce at Star Racing take the 103 engine to his 107 kit, taking it from 76 to 130 hp. So it wasn't your average Road Glide Spaeial. This new bike has much better handling than my 2015, which I had added a 21" front wheel to, and then lowered the forks to bring it back to "level". The old bike still didn't handle the way I wanted, but the new CVO drops into a corner like butter. Hp/tq are a little bit higher in the rev-range than the 2-valve motors but for a stock bike, it pulls and accelerates well. The infotainment system is beyond impressive, and I'm really happy I got it. But because your question is so subjective, your mileage will certainly vary. I have also added the CVO chopped tour pack and will ultimately have some engine work one day to take it to the power-levels I came from, or higher. But so far, I'm glad I got the new CVO Road Glide, but at the end of the day, you'll be the one stroking the check for the monthly payments so only you can decide what path is right for you. Good luck with whatever you decide! I owned a 2018 CVO Road Glide. I put 24,800 miles on it before I traded. Only issues I had with it was blowing Saddlebag lid speakers. It was my 6th CVO since 2009. I do not feel they hold their value as well as they use to. That said, I believe it is true of all Harleys now, not holding value as well. I now have a 2019 CVO Road Glide with just over 2100 miles on it. Several have had issues with the M8 (2017-2019) motors sumping, but most of them have had a Stage IV kit installed, not all though. They claim the new design oil pump seal fixes it it for 2019. That said there are a couple that have had the 2019 motor sump. One time my 2018 felt like it might be sumping, but after a short stop I never felt the loss of power again. It's a new motor design for HD. I do think some have issues, but not as many issues as were with the Previous Twin Cam 110 motors used from 2007 until 2016 in CVO bikes. Those had some issues never fixed, like lifter Failure. I think the M8 is a better motor than the twin cam. Clearly, mine is a better economic value, and that's without considering the extra interest you'd pay on financing the higher CVO price (and I paid cash for the bike and all mods) and the higher insurance rates. I think you'll find that the engine mods will not add value, and may, in fact, decrease value. as far as insurance, the cost of insurance for my 2013 cvo has been pretty consistently on par with the cost of the insurance for my wife's 2012 non cvo. especially as hers has an extra $10,000 accessories coverage that the cvo doesn't have to have. YMMV, but my experience has been as I described. A large part of it depends on the buyer's desires. I have a ‘19 Mako with about 2k miles and really really like it. The color is AWESOME outside, but difficult to keep clean. I had a ‘17 CVO Limited with about 10k trouble free miles and an ‘18 RGS with about 3k trouble free miles. Both of those had the HD Stage 2 TQ cam set up. The Mako is by far my favorite between those bikes. As for value here are my thoughts. You cannot buy a non CVO bike and add all of the CVO things to it for the price. If you do spend $10-$15k on add-ons to a non CVO bike you will most likely get 25% or less the value of what you added when you trade or sell. You build a bike for your enjoyment and what you can afford, not to get your money out of it down the road. As for my ‘17 CVO I bought it new Feb ‘17 and paid sticker, traded it July ‘18 and got $36.5k on trade. I actually traded down to the ‘18 RGS. Got the RGS $3k off sticker so I think I did ok. As for the Mako I have already added about $3.5k in extras to it and like I mentioned I know that is money I will not get back. I agree with Dave, generally speaking Harley’s do not hold their value nearly as well as they did in the past. The ‘18 CVO RGs still seem to bring good money and with the colors on ‘19 I think the CVO RGs will do ok for the next few years. I definitely think my 2000 BMW K1200 was a better ride. I have buyers remorse. 2015 CVO Glide. I went with a Harley because the service at the BMW dealer was awful.